This hot-button whine was sent in from one of our readers. So…is she saying that because I’m childless I’m not capable or “real” love or that I will be denied the experience of the highest expression of love? Whether this makes your blood boil or cuts you to the core, whine away, sisters! 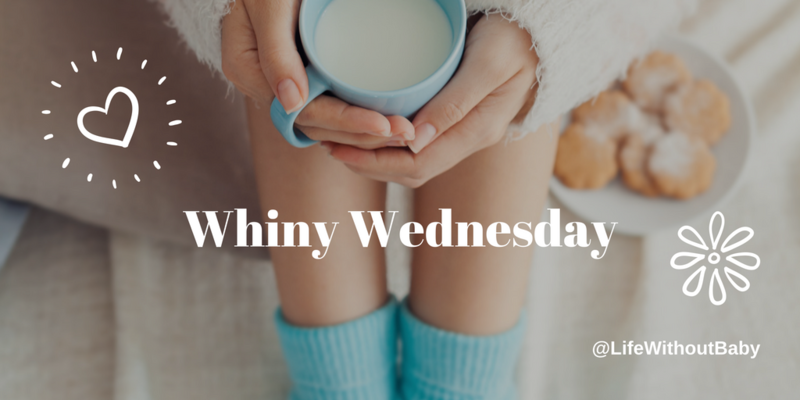 And if you have another great whine you need to get off your chest this week, here’s the place to let it rip. A friend asked me this once, and I was shocked to find myself stumbling over my answer. I couldn’t even name one thing. I think many us (especially we women) were raised to be modest, not boastful. We often have no problem telling someone else what we admire in them, but can’t then turn the spotlight on ourselves. And even when we do, we can so often point out all the areas for improvement rather than the good things we see in ourselves. I will always stick up for the underdog. I am not a quitter. So I challenge you now. 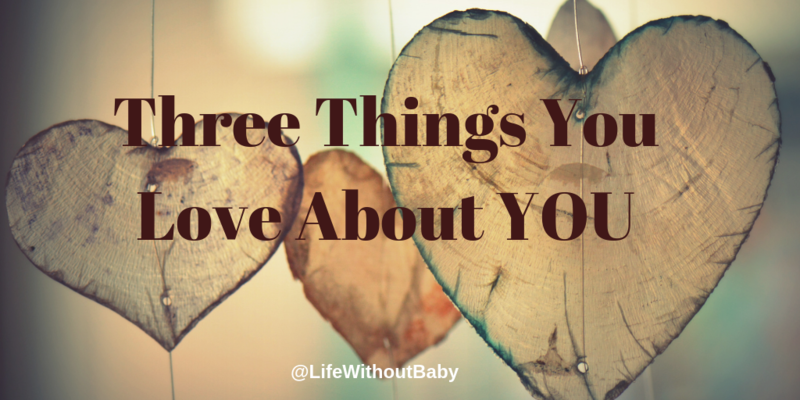 What are three things you love about yourself? A friend asked me this recently, and I was shocked to find myself stumbling over my answer. I couldn’t even name one thing. Anyone who knows me in the real world will tell you that, in person, I am not a gusher. I’m an enthusiastic sort when the occasion calls for it, but I’m not one for public shows of excessive affection. If I don’t tell you “I love you,” don’t assume I don’t care; it’s not a phrase I toss around lightly and if I say it, I mean it. Like I say, I’m not big on public affection, either physical or verbal. So, I’m not going to tell you, dear readers, that I love you, because I’ve never even met most of you, and “love” just isn’t the right word. What I will tell you though, is how very much I appreciate you and how glad I am that you are in my life. I have been sitting here reading the comments you’ve left on some recent posts and I am touched by your incredible generosity in sharing your hearts with me and with other readers. I am in awe of how you reach out to one another – to people you’ve never even met – and offer words of kindness and encouragement. It is the most wonderful and inspiring thing to watch, and seeing it restores my (sometimes flagging) faith in the human race. As I said, I’m not a gusher, but today I felt the need to gush a little. It is Whiny Wednesday, of course, and even though I don’t personally have anything to whine about today, I hope that my mellow mood won’t deter you from letting rip, should you need to. Whine on! I hate Valentine’s Day. It’s a made-up holiday fueled by jewelers, florists, candy makers, and advertisers who make us feel we need to overspend, and then make us feel like losers if what we receive doesn’t live up to our expectations. Rubbish! If someone loves me, I see it in his eyes, I feel it in his touch, I experience it in how he treats me every day. However. Years and years ago, when I was very immature (i.e., I thought I had everything figured out and wasn’t shy about sharing my opinions), I announced my boycott of the holiday to the sweet man I was dating. The look on his face…he was crushed. I came to discover he had made plans for a lovely yet simple evening and had selected a couple of very thoughtful gifts. I felt like such a turd! Because when I thought about it, I knew how much I loved giving gifts to the people I loved, how much I enjoyed surprising them, delighting them, and making them feel special. Shame on me for taking that away from him. Since then, I’ve learned to graciously accept the gifts I receive, whatever their origin, motivation, or price tag. My dad still sends me a card on this day, and I keep them among my treasures. I consider myself a rich woman indeed when I receive a sheet of construction paper decorated with abstract images in crayon (“That’s you and Jake on the playground,” my sister explains. Of course!). I might get a call from a far-flung friend and spend 10 precious minutes catching up with her. Looking at the bigger picture, every day I give thanks for the gifts of good health, a job that I love, and a roof over my head. Today is a tough day for many people. It’s so easy to fall into self-pity, to catalogue what we lack instead of counting our blessings. So today I invite you to join me in acknowledging and accepting our gifts, whatever form they may take. Then, think about what you can give of yourself to make this day lovelier for someone else. Kathleen Guthrie Woods is a Northern California–based freelance writer. Tonight she’ll be surprising the love of her life with his favorite treat, a home-baked cherry pie. I’m not sure if it’s the same where you live, but if you happen to be in the U.S., you’ll already be into several weeks of red and pink window displays and newspaper ads for romantic dinners, and great prices on jewelry and red roses. Tomorrow is Valentine’s Day, and like so many holidays, it’s become a huge commercial venture here. Despite my somewhat curmudgeonly attitude towards Hallmark holidays, I would ordinarily be taking the opportunity to wish you a Happy Valentine’s Day. But my resistance comes from somewhere deeper than a distaste for over-commercialism. Now that I am not going to be a mother, I have a more highly tuned awareness of the minefield of global holiday greetings. I know how hurtful it can be for a stranger to glibly wish me a happy Mother’s Day, not realizing what a painful thing that is for me to hear. Because of this, I now appreciate that by wishing “Happy Valentine’s Day” to everyone I meet, I could inadvertently be reminding that person of what they don’t have. And I know how that feels. 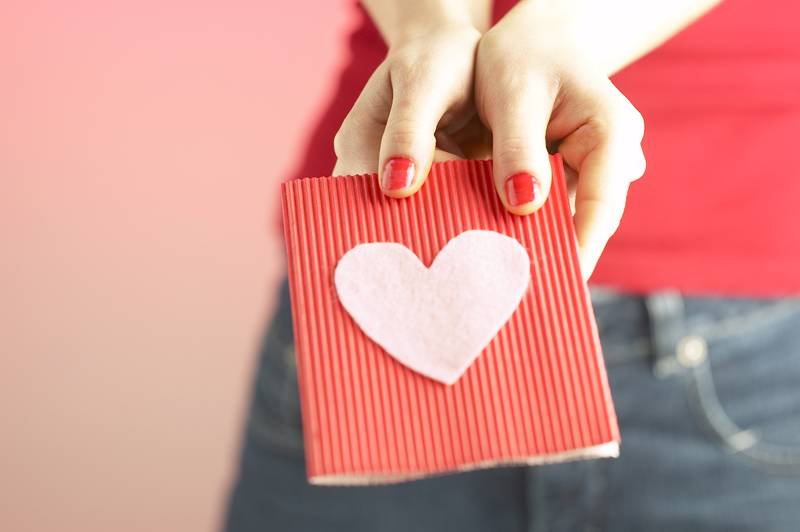 Shouldn’t Valentine’s Day, like Mother’s Day, be a personal exchange between the two involved parties? So, I won’t be broadcasting a Happy Valentine’s Day message here. But instead, I wish you love and I wish you someone good to share your life with, whatever that means to you. If you have that love, cherish it. And if you don’t have it, I hope you find it soon. Wishing you love today, in whatever form it comes. The questions a husband asked his barren wife many centuries ago could just as easily represent feelings secretly harbored by our family members today. Can you imagine poor Elkanah sitting by the bedside of his wife, Hannah, feeling completely helpless and perfectly invisible as she quietly sobbed and rocked herself? And I ask myself, how many times did my own husband sit by me feeling the same thing? Or what about my sweet mother? Or even my best friend? I was blind to their love, too, as I grieved the loss of my children. In the biblical story, Elkanah had two wives named Hannah and Peninnah, but only Hannah was barren. Peninnah used her status as a “mother of sons and daughters” to provoke and torment Hannah because she viewed her as a rival. Seeing what was going on, Elkanah gave “a double portion to Hannah because he loved her, though the Lord had closed her womb” (1 Samuel 1:5). When we are provoked, it’s easy to devalue the close relationships we enjoy with our spouse and other best friends. I guess it’s because the power of the moment gets our focus fixed on what we lack rather than on all that we have. For me, it was like a giant microscope was shoved into my face every time I had to deal with a pregnancy announcement. My grief forced me to peer down a tube at this giant hole in my soul, blinding me to the daily favor I enjoy as a child of God. And speaking of God, the same questions could be posed in a different way: Isn’t our relationship with the Lord better for us than ten sons? 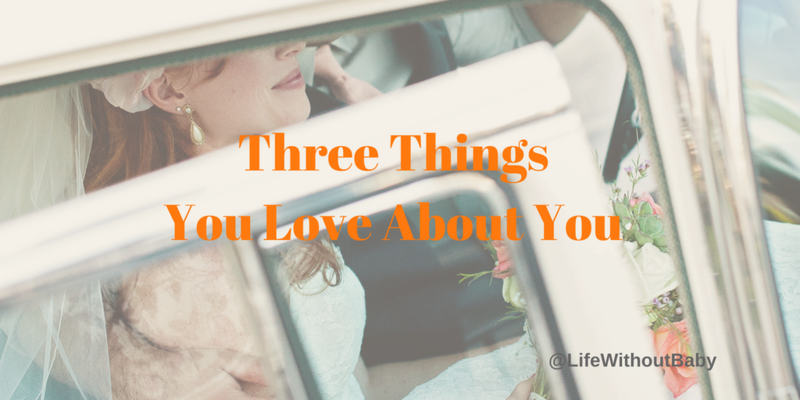 And where in our lives has God given us a “double portion” because we are so deeply loved? It’s something to think about this Thanksgiving, as we count our blessings. Dorothy Williams lives near Chicago. She enjoys time spent with her family in Christ. Quite frankly being a friend is sometimes too much effort. Friendships take time and energy and when you’ve lots of things on your plate, they often move further down the ‘To Do” list. But I’ve been reminded recently about the value of those friendships and how nurturing them, even just a little bit, can reap the most beautiful rewards. In October 2009 I was diagnosed with cervical cancer. Now, don’t get me wrong, it came as a huge shock, it was horrible at times, and very stressful. But two years on I am cured and, compared to what many people go through, it was a walk in the park. Around that same time a friend was diagnosed with lung cancer. A healthy living, non-smoking vegetarian, a loving mother to a three-year old boy, a trusted friend, an honest and caring giver, a wonderful cook, one of the most fun people I know. Sadly, she passed away earlier this year at the age of only 42 leaving her beautiful boy to know her through our memories and stories. I can’t begin to tell you how much I’ve wanted to call her in the last few months; just for a chat, to ask her opinion, to get that recipe for melt-in-the-mouth-5-hour-roast-lamb, to ask her about the places she travelled, to share a laugh but most of all to tell her just how much I love her and how much she made a difference in my life. I was “brave.” I told her how much I loved her before it was too late, but how many of us don’t? Having cancer certainly taught me who my real friends are, and I’m sad to say that I’ve said “farewell” to a few folk in the last couple of years. It’s always a difficult decision to choose to end a friendship whether actively or simply to let it drift away, but there simply isn’t time enough to maintain a friendship with every great person that you meet. I’ve recently returned home to Scotland from my dream holiday visiting the fantastic national parks of southwest USA. Whilst I was there I managed to meet up with my oldest school friend in Las Vegas. She has lived in the US for almost 20 years and our contact in that time has been sporadic. We were in grave danger of drifting apart. But when she emailed to say that she and her husband would love to meet up with us in Vegas, wild horses wouldn’t have stopped me. It was the best time of our holiday. Seeing the Grand Canyon was truly awesome, but wrapping my arms around my childhood friend and receiving a hearty hug back is beyond description. The two days we spent together felt wonderful and like I was 15 again (well 15 again but with serious jet lag). We couldn’t remember how or when we met but we can’t remember a time before we knew each other. A really magical time. So, now I’m home, what am I going to do about my friendships – the ones that really matter? Refreshed and renewed, I’ve been calling, emailing and lunching in a frenzy with the folks close to home, and less than a week after returning home from the USA, I’ve booked a flight to California to see my friend again. She is over the moon and we’re planning what we’re going to do together already. It seems silly that I’ve neglected this friendship for so long. When I see her in six weeks time, I’m going to give her a big hug and say those three magic words. Jill B. lives childfree in Scotland. She loves to travel to see beautiful places and good friends.